Unleash your inner genius and become a master of mythology with this interactive trivia book from Jeopardy! 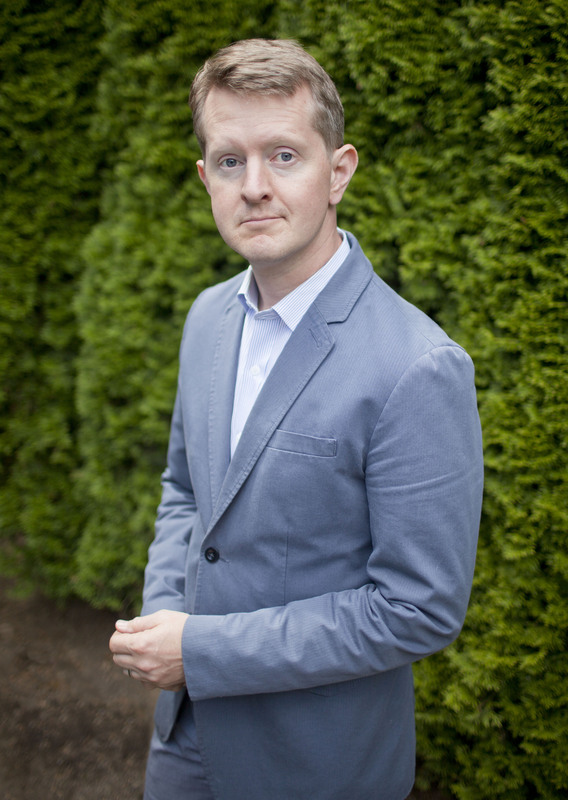 champ and New York Times bestselling author Ken Jennings. 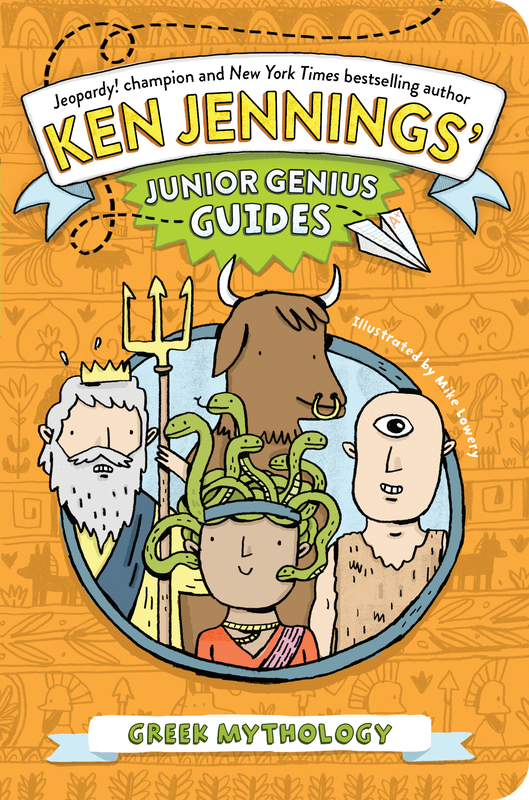 With this Junior Genius Guide to Greek mythology, you’ll become an expert and wow your friends and teachers with all the best ancient stories: how Prometheus outsmarted the gods, how Achilles’s heel led to his death, and how we mere mortals always seem to get mixed up in so many misadventures. With great illustrations, cool trivia, and fun quizzes to test your knowledge, this guide will have you on your way to whiz-kid status in no time! Every day we forget stories. I saw a funny video about a cat on the Internet this morning, but when I tried to tell a friend about it, I suddenly had no idea how it ended. A list of best-selling books from ten years ago would have authors on it that I don’t even remember. The thing you have to realize about Greek myths is that these are stories so good that we’ve managed to remember them for more than three thousand years. Three thousand years! When these stories were first told around a banquet table or a campfire, paper hadn’t even been invented yet to write them down on. The entire world probably had only forty million people in it—roughly the population of the state of California today. Two of those people were your great-great-great-great- . . . great-grandparents. Today kids still love Greek myths, but they aren’t just fairy tales for children—they’ve become woven into our everyday life. Have you ever heard anyone say that someone has “the Midas touch” or “an Achilles’ heel”? If references like that are all Greek to you, don’t worry. It just means that today you’re going to hear some great stories for the very first time. Ancient Greek buildings sometimes had showers and even central heating. Around 600 BC, the Greeks dug a two-thirds-mile tunnel on the island of Samos to supply the capital with water. And the Greek explorer Pytheas sailed as far north as Scandinavia! Around 1960, scientists discovered that this ancient Greek device found in a ship-wreck was actually an early computer! Astronomers designed it to calculate positions of the sun, moon, and planets. Greek scientists were not perfect, of course. Even bright guys like Aristotle thought that the Earth was the center of the universe, and that the heart was the center of human intelligence. (The brain, he said, was just a big cooling organ.) The great Greek mathematician Pythagoras refused to eat (or even touch) beans: He and his followers were sure that beans had souls! But in general, the Greeks reached heights of scientific knowledge that wouldn’t be surpassed in Europe for almost two thousand years. But apart from their scientific thinking, the Greeks also had a rich tradition of storytelling about gods and goddesses, brave heroes, and hideous monsters. What we think of as ancient Greek civilization was actually a big clash of cultures: a series of migrations from the north into the prehistoric civilizations of the Greek isles. Each of these tribes brought their own oral traditions with them, and Greek mythology was what they created from this mishmash of different stories. The Greeks were polytheists (“pah-lee-THEE-ists”), meaning they believed in many gods. They worshipped these gods by making offerings at stone altars. At home their courtyard would have an altar to a household god. Their village or city would have temples with larger altars and statues of different gods. Before a family meal, you might sacrifice to Hestia, the goddess of the hearth, with an offering of burned meat. Before beginning a journey, you might travel to a temple of Hermes, the god of travelers, to pray and leave a votive offering (an object like a coin or a small statue) in his sacred grove. In 1970 a long-lost temple to Aphrodite was unearthed at Knidos, in modern-day Turkey. Aphrodite was the Greek goddess of love, and one of her messengers was the rainbow goddess Iris. Weirdly, the archaeologist who rediscovered the temple was a New York socialite named Iris Love! When they needed special guidance from the gods, Greeks would go to specific temples and consult oracles. Oracles were priests or (usually) priestesses who spoke on behalf of the gods. At the temple of Apollo at Delphi, the oracle would offer prophecies on the seventh day of every month. She would chew leaves from a sacred laurel tree and inhale volcanic fumes. In a frenzied state, she would then begin to utter strange sounds and words, which priests would translate to visitors. In myth, the advice from oracles isn’t like a weather forecast—it’s always 100 percent accurate, no matter what you do to avoid your fate. For example, an oracle once told King Acrisius of Argos that his grandson would kill him one day—and even though he tried to abandon the grandson at sea, the baby survived and grew up to be Perseus, a great hero. Many years later, while Perseus was competing in an athletic contest, he accidentally threw a discus into the crowd—and killed his grandpa. King Croesus of Lydia once asked the oracle at Delphi if he should go to war with the Persians. The oracle told him, “If you attack Persia, you will destroy a great empire.” Croesus was thrilled and marched his men to war, but lost badly. The empire he destroyed turned out to be his own! At larger religious feasts and festivals, whole cities would worship the gods together. Athens, the greatest of the ancient Greek mini-kingdoms, had more than one hundred of these festivals every year, so Athenian kids must have had it easy: that’s a different holiday every three days or so! Many Greek scientists, especially in later periods, believed that the earth was round, but in mythology, the earth is a flat disk divided into three continents: Europe, Asia (Asia Minor and the Near East), and Libya (Africa). These lands were surrounded on all sides by Oceanus, the source of all water. Oceanus was a Titan with six thousand children—can you imagine all the parent-teacher conferences that poor guy had to go to? His three thousand sons were the earth’s rivers and his three thousand daughters were ponds and springs. Mountains were holy places where the gods were known to walk—like Mount Ida, where Zeus was raised, or Mount Helicon, where the Muses sang. The sky was a dome held up in the west by the Titan Atlas, and many gods traveled across it. The sun was Helios, who kept herds of cattle and sheep—one each for every day of the year—on a faraway island in the east. Every day he drove his fiery chariot across the sky, seeing and hearing everything, like a spy satellite, until he landed in the west at sunset. Then he would sail back home in a great golden cup and feast until dawn. The moon goddess was Selene, who watched over the earth by night from her silver chariot. Eos, the rosy-fingered goddess of dawn, lived in the east, and the morning dew was her tears after her son Memnon died at Troy. Lots of Greek myths are stories to explain the origin of things in nature, like lightning being the anger of Zeus, or dew being the tears of Eos. Here are three you might not know about. 1. THE HYACINTH FLOWER Hyacinthus was tossing a discus around with the god Apollo when Zephyrus, the mean west wind, blew Apollo’s throw off course. Hyacinthus was killed. A bright red hyacinth flower rose from his spilled blood, and the leaves were marked with a pattern like the letters AI AI, the sound of Apollo’s grief. 2. THE ROOSTER The gods Ares and Aphrodite asked young Alectryon to warn them when the sun came up, so that Helios wouldn’t catch them together. Alectryon fell asleep, so an angry Ares turned him into a rooster, which is why roosters always remember to announce the sunrise. 3. THE MILKY WAY The hero Heracles was incredibly strong, even as a baby. The first time he was given milk as a newborn, he sucked up so much that he coughed violently, spattering the milk on the heavens, which we can still see today as the Milky Way. Greeks would put a coin in a corpse’s mouth before it was buried, so that the dead person could use it to pay the ferryman, Charon, to take him across the River Styx. Three mythical kings—Rhadamanthus, Aeacus, and Minos—would then judge every soul. DID YOU LIVE A GOOD LIFE? Yes The Elysian Fields. A paradise of cool west winds, sports, and music. The soil bears three crops a year, and earth’s dead heroes live in peace. Sometimes The Asphodel Meadows. A vast, flowered plain, ghostly and boring. No one remembers their name—all memories of life have been wiped away by the River Lethe. Nope Tartarus. A pit of terrible winds, surrounded by three layers of night and locked by Poseidon’s great bronze doors. It’s full of imprisoned monsters as well as mortals who deserved special punishment. All the planets of our solar system are named after Roman (or Greek) gods—except one. Which one? Even three thousand years later, if you don’t know these stories, you’re really myth-ing out.